The nature in and around Sarajevo is gorgeous and there are many attractive locations that are ideal for outdoor activities just a ten to forty minute-drive from the center of town. Whether you love to walk in the mountain air or try some adrenaline sports, you are sure to find the perfect way to spend your free time in Sarajevo. City walking areas and parks are favorite destinations for bicyclists, runners, rollerbladers, skateboarders and others who love sports and nature, especially on weekends and holidays. Ambassador's Alley is located in the eastern part of town, with more than 150 linden trees that have been planted by diplomats who have served in BiH. Ambassador's Alley will lead you to Dariva, which is home to a rock climbing site of the same name. There is also the nearby Babin Zub, one of the first rock climbing sites in the region. On the other end of town is Ilidža, home to the beautiful Velika Aleja. 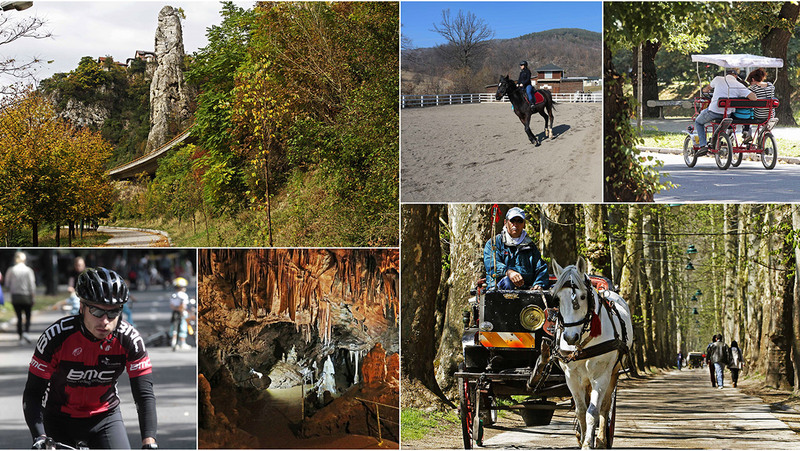 You can either walk along it or take a horse-drawn carriage to reach Vrelo Bosne, a natural monument. Wilson’s Promenade is the most popular walking area and serves as an oasis of peace in the center of town. The road that runs parallel to this walking lane is closed to traffic on weekends and after 5:00 p.m. on weekdays and the popular “Vils” is teeming with visitors of all ages who enjoy recreational activities and sports. There are some spots that have exercise equipment, as well as a few fenced-in play areas for children and dogs. The public bicycle system, Nextbike, makes it easy to get around town. Bikes are available at a few rental stations and bike paths are marked in most parts of town. A great way to become better acquainted with Sarajevo is to participate in the Giro di Sarajevo, the city’s largest bike race, with a 16-kilometer course that wraps around town during September. Runners from all over the world come during September to participate in the Sarajevo Half Marathon. This 21-kilometer race passes through the most attractive parts of town and is certified by the International Association of Athletics Federations. Sarajevo golfers enjoy the VF Golf Course, with its six holes, driving range and practice area. The course is located in the city neighborhood, Kromolj, on a hill that is surrounded by forests. The Safet Zajko Center for Education, Sport and Recreation offers tons of outdoor activities: an athletic track, alpine training park, football field with artificial turf, tennis courts, long jump track, basketball court, sand courts for basketball and volleyball, a few children’s playgrounds…. Summer in the Park - Hastahana, a manifestation that will be held at Hastahana Park in Marijin Dvor (June 15-September 15), will offer citizens and Sarajevo visitors a series of interesting events for all ages throughout the summer. In preparation for this manifestation, the public lighting was totally revamped, as were the Sprite skate and bike park and PAN basketball court, where the very successful street basketball tournament, PAN 3x3, was recently held. The Trik sand volleyball court and the Gazprom football arena for futsal have also been installed. The park’s giant chess area has been redone and a new 27-meter-long Sinkro bocce field has been built, where a big bocce tournament is planned for early September. The pre-existing Ciciban children’s play area has been fenced in, new features have been added and the Jaffa Fun Park will offer tons of daily fun for youngsters, including spending time with animators, interesting games, happy weekends…. A large bungee trampoline, a spinning swing ride and a train for kids have also been installed. Thermal Riviera in Ilidža offers some relief from hot summer days and the complex has indoor and outdoor swimming pools filled with thermal water and offers activities for the entire family. There are a few horse clubs on the hills around town that offer riding lessons and the pleasure of getting to know these noble animals. A walk up to Čavljak and Skakavac Waterfall offers the perfect escape from the city streets and caving enthusiasts can enjoy some of the caves around Sarajevo, the most popular of which are Bijambare, Orlovača and Novakova Pećina (Novak’s Cave). During winter months, both residents and Sarajevo visitors enjoy skating at the Zetra Olympic Complex, as well as at the attractive skating rink installed as part of the Sarajevo Holiday Market. This event and its many attractions draw visitors of all ages during the winter tourist and holiday seasons. The Olympic Mountains are located within a 30-kilometer radius from the center of Sarajevo and are easy to reach because they are connected to town by good roads and city buses run to some of the mountain destinations. Sarajevo mountains are perfect places every season of the year for those who love walking, hiking and extreme sports, whether as amateurs or professionals. The terrain around Sarajevo is perfect for mountain biking, as confirmed by National Geographic Traveler, which has named BiH and Sarajevo one of the world’s top ten adventure travel destinations for its fantastic mountain bike trails. So far, about 150 kilometers of trails have been marked on the mountains, Bjelašnica, Igman and Treskavica. Treba Downhill is an event that offers the best chance to compete in this sporting category. It is one of the most popular races of its kind in mountain biking’s fastest discipline and is held in August. There are places outside of town that are perfect for riding quads, which can be rented at the Brus recreation site on Mt. Trebević. Here you will also find excellent courses for paintball, basketball, volleyball and futsal. Not far from Brus is Sunnyland, a unique amusement park for children and adults. The main attraction is the 600-meter-long adrenaline-pumping Alpine Coaster, which was installed on the slopes overlooking Sarajevo, so you can enjoy a wonderful view of town during the crazy ride. Mt. Trebević is also home to the protected rock climbing site, Via Ferrata Bijela Stijena (White Rock), a real challenge for rock climbers which also offers a wonderful view of Sarajevo. Major international events are often held on the mountains around Sarajevo. There is the Jahorina Ultra Trail which includes four races of various lengths and is taking place on July. The tour agency, MeetBosnia, is available for visitors who are keen to get to know hard-to-reach areas of Bosnia and Herzegovina. The company specializes in off-road tours with UTVs, as well as tours that combine rafting, canyoning, paragliding…. 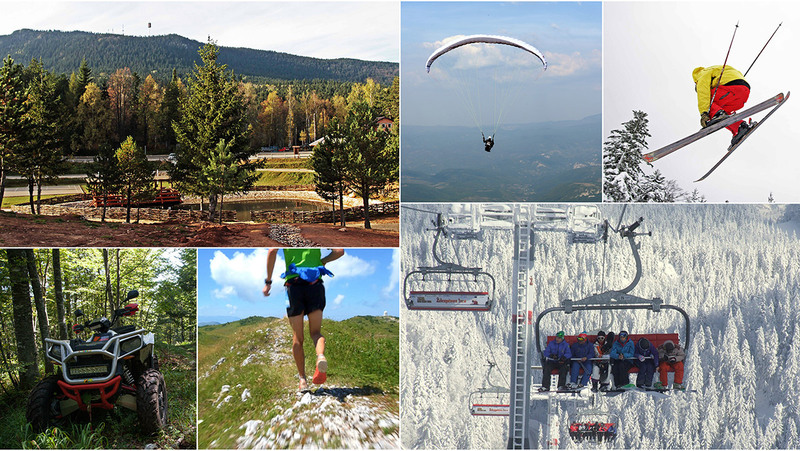 There are several extreme sports clubs that offer paragliding on Bjelašnica and Jahorina. During the winter, Bjelašnica, Igman and Jahorina offer more than 40 kilometers of ski lanes that are perfect for skiers of all levels, from beginners who are starting out on easy lanes and skiers who are just warming up on medium-hard courses to those making descents on adrenaline-pumping lanes geared for professionals. Jahorina is a relatively flat mountain, but Bjelašnica has glacial valleys, limestone peaks, expansive plateaus and untouched beauty. Mountain centers also offer Nordic skiing and racing, snowshoeing, ski touring (a mix of skiing and hiking), winter climbing, snowmobiling, snow biking, ski sledding…. Štinji Do on Bjelašnica is an excellent place for snowboarding enthusiasts, as well as for those who love sledding and snowmobiling. The Red Bull Home Run, a massive downhill event held for snowboarders and skiers on some of the mountains, offers an unforgettable experience during the winter months, as does the FIS Snowboard Europa Cup, the largest snowboarding event in BiH.